Can you confirm these amateur observations of Brachymeles boulengeri? Distribution Philippines (Panay, Visayas, Mindoro, Luzon, Polillo, Bohol). Type locality: Polillo I., P. I. Coll., E. H. Taylor, July 15, 1920. Neotype locality: fallen, rotting log in secondary growth forest (1000 to 1230 h) in Barangay Pinaglubayan, Municipality of Polillo, Quezon Province, Polillo Island, Philippines (14° 45’ 09’’ N, 121° 58’ 06’’ E; WGS-84. Types Neotype: PNM 9720 (RMB Field No. 5647, formerly KU 307756), adult male, collected by RMB, J. Fernandez, Y. Vicente, and M. Vicente. Diagnosis Diagnosis. Brachymeles boulengeri can be distinguished from congeners by the following combination of characters: (1) body size moderate (SVL 60.5–93.1 mm); (2) pentadac- tyl; (3) Finger-III lamellae five or six; (4) Toe- IV lamellae nine or 10; (5) moderate limb length; (6) supralabials six or seven; (7) infralabials seven; (8) pineal eye spot present; (9) supranasals not contacting on midline; (10) prefrontals not contacting on midline; (11) midline contact of first pair of chin shields; (12) enlarged chin shields in two pairs; (13) nuchal scales undifferentiated; (14) fourth and fifth supralabial below eye; (15) auricular opening present; (16) continuous, light dorso- lateral stripes present; and (17) middorsal stripes absent [from SILER & BROWN 2010]. Comment Pentadactyl species. See also B. gracilis. 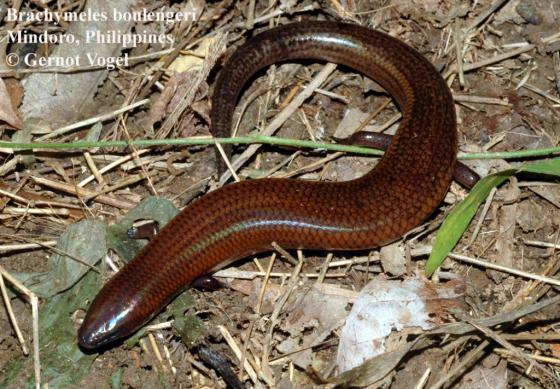 Subspecies: Brachymeles boulengeri boholensis BROWN & RABOR 1967, Brachymeles boulengeri mindorensis BROWN & RABOR 1967, and Brachymeles boulengeri taylori BROWN 1956 have been elevated to full species status.